When Mary and Joseph present the infant Jesus in the temple, Simeon predicts that a "sword" (of sorrow) will pierce Mary's soul. “Now there was a man in Jerusalem called Simeon, who was righteous and devout. He was waiting for the consolation of Israel, and the Holy Spirit was upon him. It had been revealed to him by the Holy Spirit that he would not die before he had seen the Lord Christ. Moved by the Spirit, he went into the temple courts. When the parents brought in the child Jesus to do for him what the custom of the Law required, Simeon took him in his arms and praised God, (…) The child's father and mother marveled at what was said about him. Then Simeon blessed them and said to Mary, his mother: "This child is destined to cause the falling and rising of many in Israel, and to be a sign that will be spoken against, so that the thoughts of many hearts will be revealed. And a sword will pierce your own soul too." Our Father, wo art in Heaven, hallowed be Thy name, Thy Kingdom come Thy will be done on Earth as it is in Heaven. Give us this day our daily bread and forgive us our trespasses as we forgive those who trespass against us. And lead us not into temptation but deliver us from evil. Amen. When King Herod ordered the death of all male children ages two or younger, Mary and Joseph fled to Egypt with the infant Jesus. “When they had gone, an angel of the Lord appeared to Joseph in a dream. “Get up," he said, "take the Child and His mother and escape to Egypt. Stay there until I tell you, for Herod is going to search for the Child to kill Him." So he got up, took the Child and His mother during the night and left for Egypt, where he stayed until the death of Herod. And so was fulfilled what the Lord had said through the prophet: "Out of Egypt I called my Son." Mary and Joseph search for the child Jesus for three days, finding Him at last — after agonizing sorrow — in the temple. As Jesus makes His way to Calvary, condemned to crucifixion, He meets His mother, Mary. He is bruised, derided, cursed and defiled and her sorrow is absolute as Jesus drags His own cross up the hill of His crucifixion. “As they led him away, they seized Simon from Cyrene, who was on his way in from the country, and put the cross on him and made him carry it behind Jesus. A large number of people followed Him, including women who mourned and wailed for Him. Jesus turned and said to them, daughters of Jerusalem, do not weep for Me; weep for yourselves and for your children. For the time will come when you will say, `Blessed are the barren women, the wombs that never bore and the breasts that never nursed!' Then they will say to the mountains, "Fall on us!" and to the hills, "cover us!"' For if men do these things when the tree is green, what will happen when it is dry?" Mary stands near her dying Son unable to minister to Him as He cries "I thirst." She hears Him promise Heaven to a thief and forgive His enemies. His last words, "Behold your mother," charge us to look on Mary as our mother. “Near the cross of Jesus stood His mother, His mother's sister, Mary the wife of Clopas, and Mary Magdalene. When Jesus saw His mother there, and the disciple whom he loved standing nearby, He said to His mother, "Dear woman, here is your son," and to the disciple, "Here is your mother." From that time on, this disciple took her into his home”. Jesus is taken down from the cross and His body is placed in Mary's arms. The passion and death are over, but for His mother, grief continues. She holds His body in her arms. The body of Jesus is laid in the tomb. The most tragic day in history ends, Mary alone in sorrow, awaiting the Resurrection. 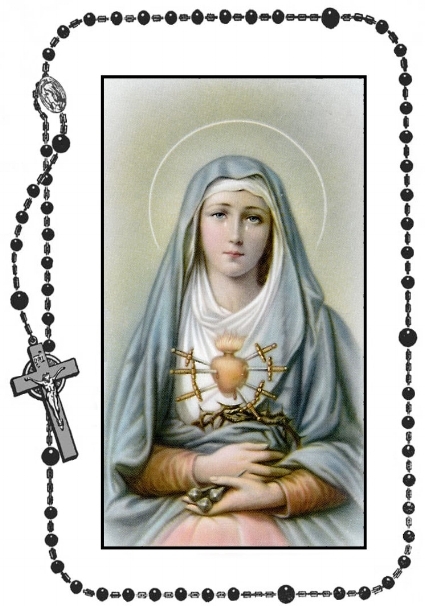 "Sorrowful and Immaculate Heart of Mary, pray for us!"